Star City has a new archer in town, and her name is Thea Queen. Arrow Season 4 will feature Thea as a full-fledged member of Team Arrow fighting crime out in the field as Speedy. We briefly saw her in costume in the Season 3 finale, but following the official portraits of Oliver Queen in his Green Arrow costume and John Diggle wearing his Magneto-style helmet, The CW has released this official photo of Willa Holland as Thea suited up. Unlike what Oliver and Diggle are wearing this season, the costume that Thea’s wearing isn’t a new one. It’s the same ensemble that her ex-boyfriend Roy Harper wore as Arsenal, albeit adjusted to fit her size. Still, seeing a high resolution shot of her as Speedy just drives it home further that she’ll be lending her crimefighting and archery talents to the show this season. Now that Oliver, Diggle and Thea have been covered, the only costumed member of Team Arrow that has yet to get an official Arrow Season 4 image (complete with city background) is Laurel Lance as Black Canary. Although Thea’s been a main character on Arrow since the beginning, it wasn’t until Season 3 that she started getting directly involved with her brother and Roy’s vigilante life. After leaving then-Starling City with Malcolm Merlyn in the Season 2 finale, she learned how to fight during the interim, and by the time Oliver reunited with her in “Corto Maltese,” she boasted impressive moves. Oliver eventually revealed himself as The Arrow to her in the episode “Canaries,” making her Team Arrow’s newest member. 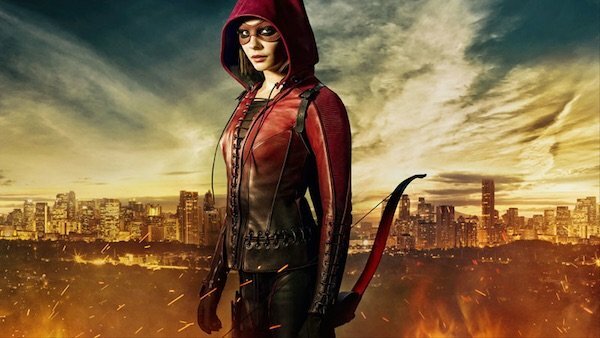 After Thea met up with Roy following his faked death in “Broken Arrow,” he left her his Arsenal costume, which she decided to don during Ra’s al Ghul’s attack in “My Name is Oliver Queen.” After seeing his sister as the new crimson archer, Oliver assigned her nickname Speedy as her superhero moniker. When Season 4 kicks off, Thea will be protecting Star City alongside Diggle and Lauren, but when Damien Darhk and H.I.V.E. arrive, they’ll be forced to bring Oliver and Felicity back to help them against this new threat. Thea will also find herself suffering more aftereffects from being healed in the Lazarus Pit. That’s right, there’s more she’ll have to deal with than just brief memory loss. On top of that, she’ll also find a new love interest in her brother’s new employee Alex Davis, played by Suburgatory’s Parker Young (Ryan Shay). We’ll see Thea in action as Speedy when Arrow Season 4 premieres tomorrow at 8 p.m. EST on The CW.